A corner rounder turns sharp, square corners into smooth, round corners instantly. It is ideal for eliminating the danger of sharp, square corners on plastic products and also preventing paper corners from bending and tearing. Paper cutters also create a unique look of business cards, covers, menus, brochures and more! The Lassco Wizer CR-20 Desk Top Round Cornering Machine handles up to 1/2” of stock per cut with several different cutting radius’s to choose from: 1/8”, 1/4”, 3/8”, or 1/2” which is all included. However, additional cutting units and corner sizes can be added to the machine to offer a bigger variety. The CR-20 Round Cornering Machine is a low to medium duty table top round cornering unit for small to standard sheet size applications such as standard letter size or smaller. There are several benefits that the CR-20 Corner Rounding Machine offers. It is small enough to fit on any desk or table, and is light enough to easily be moved to different locations because it is only 3 pounds. The CR-20 has a 1/2″ cutting capacity, meanwhile most low volume corner rounders have a capacity of about 1/4″. The CR-20 offers a large variety of cutting dies which are available, giving you the versatility you want when you need it. This machine can also cut through a variety of materials including plastic and plastic-like materials. However, like every other product there are limitations. The CB-20 is built for low to medium volume jobs, therefore, high volume jobs are not recommended. 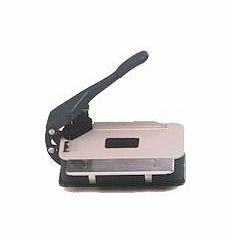 Although the CR-20 5” x 10.5”, its size limits the sheet capacity to smaller papers. If you have any questions or are interested in purchasing the CR-20 Corner Rounder, visit us at SpiralBinding.com. We have great pricing on a full line of Round Cornering Machines. Call us at 1-800-631-3572 for more information.